One resolution that many make at the start of a new year, is to save money. This may translate into simply setting aside a certain amount from each paycheck or may be as complex as developing a sophisticated budgeting system. Or, it may involve a series of lifestyle changes. So how just how difficult is to be frugal? And is there a simple formula for adopting a frugal lifestyle? While some may argue that it’s complicated and that they’ve already tried; being frugal is more than just saving money. Being frugal, to me, means being resourceful and taking on a new mindset towards money. 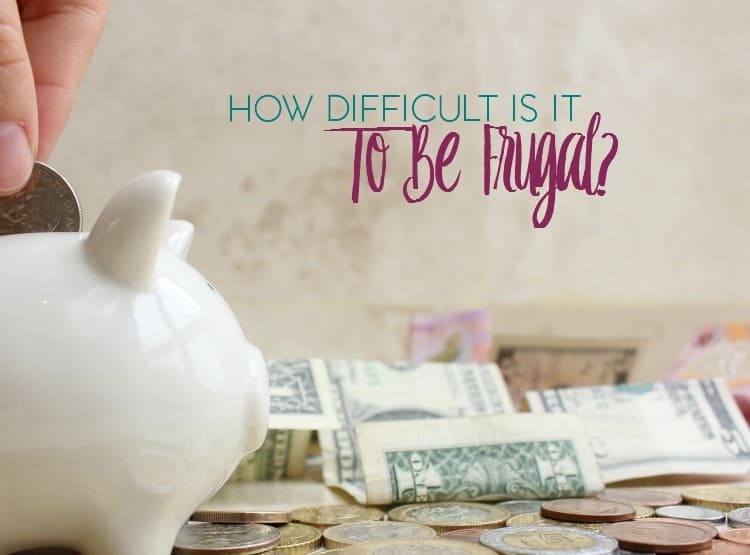 Just How Difficult is it to be Frugal? Make yourself a frugal living notebook. This is a record of your goals, plans and actions. In the future, you can look back and see how your frugal living has benefited you over time. So gather a notebook, a pen and your budget. Your budget will help you choose your goals. If you don’t have a budget, then now is a great time to start one. It can be as simple as a list of the bills that come out of each paycheck. In your notebook, make a list of every debt you owe. List what it is, the interest rate, the total amount left and the monthly payment. Every once in a while, you will update this so that you can visually see how your debts are going down over time. It is a good feeling to see how much you are paying off. Now, define and list your goals. Goals change over time, so be sure to update your list. You will be checking off things you accomplish and adding new goals. Be realistic and honest with yourself. When you look at your finances, you have to wear blinders. Don’t compare yourself to anyone else. Every financial situation is unique. Just because your friends are driving new cars, you don’t need to go into higher debt to have a new car. You don’t know or want anyone else’s financial situation. Only look at your goals when you are planning how to spend your money. We all are allowed niceties. You may be saying, why would someone who preaches frugal living be talking about a new car? That’s our perk for living frugally — bought sensibly and reasonably. Living frugally gives us the option of having a new vehicle if we choose. It’s about choices. Many of us live frugally when we don’t have choices, so that later in life we will. You have to treat yourself. It may just be a bubble bath or a free walk in the park. Its about spending life to the fullest. You can’t do that burdened by money. Frugal living is quite hard. It takes a lot of thought and discipline. Money is a tough lion to try and tame. It will seem to beat you back every time. But if you look at living frugally as a challenge with great rewards, you will be able to handle it just fine. Frugal living gives you the ability to own a vehicle without having an auto loan. You are one of the few that can go shopping without a credit card. If you are frugal and wise in your money decisions, you can have everything you want, without the stress and emotions that come with debt. To be frugal, you have to make a commitment. You can’t simply be frugal once a month and see results. You have to train yourself to be frugal in every situation. You have to make it a part of your daily routine. Look for ways to recycle and cut waste and spending. You don’t have to give the things you love up. All you have to do is see that they fit in your budget. If they don’t, you may have to put them on the back burner for a while until you free up some room. Frugal living isn’t about doing without, it’s about doing better. They take care of their money and make the most of it. Many frugal shoppers actually have everything they want and the satisfaction that it doesn’t hurt them financially. They spend time to make wise decisions. They learn how to make their dollars really work for them, instead of against them. They have more for less money. Know where your give and take is. If you care deeply about your wardrobe, but not so much about your food, spend less on food and keep your clothing the way you like it. One of the best features of frugal living is that it is based on you. Being frugal is make the best of what you have, not what I have or others have. You are cutting your spending in order to save for your goals. We all do it in different ways. Frugal living is essentially living beneath your means. You are saving and not spending every cent you make. It’s a challenge, but one that makes you a better person. It teaches us, and our children, self control. Many successful business people come from very poor backgrounds. They are successful because the frugal life taught them how to sacrifice and exhibit self-control. Frugal living is about reducing what you spend, living within your means, using what you have and taking care of your belongings, including your money. It is about making goals and working to reach them. Which would you rather be: the person who decides when and where to spend his money or the person whose money is spent before he makes it? What do you think? Is it it difficult to be frugal and can anyone adopt a frugal lifestyle?